The Matrox Rapixo CXP features four connections for interfacing to independent cameras as well as for handling higher data rates through connection aggregation. The Rapixo CXP series possess sufficient onboard memory to buffer incoming image data in situations where the host computer is temporarily unable to accept data. The fanless design for select models ensures extended use without maintenance. 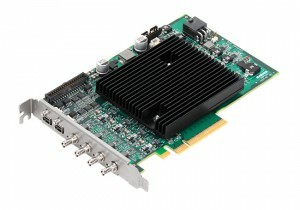 The Matrox Rapixo CXP makes use of a field-programmable gate array (FPGA) device from the Xilinx Kintex® UltraScale™ family for not only integrating the controlling, formatting, and streaming logic of the various interfaces, but also allowing developers to incorporate Matrox Imaging- or user-developed custom image pre-processing operations to offload from the host computer. The Matrox Rapixo CXP board supports 64-bit Windows and Linux through the latest Matrox Imaging Library (MIL) Software. The card also acts as a license fingerprint and can store a supplemental license for MIL software, avoiding the need for a separate hardware key. Matrox Rapixo CXP is supported by Matrox Imaging Library (MIL) software. MIL is a comprehensive software development kit (SDK) with a 25-year history of reliable performance. This toolkit features interactive software and programming functions for image capture, processing, analysis, annotation, display, and archiving operations, with the accuracy and robustness needed to tackle the most demanding applications. Refer to the MIL datasheet for more information. Accessories RAPACCKIT01 Additional Matrox Rapixo CXP GPIOs accessory kit. Includes one (1) additional mDP-to-HD15 GPIO cable adaptor and one (1) secondary dual HD15 I/O bracket with ribbon cable.